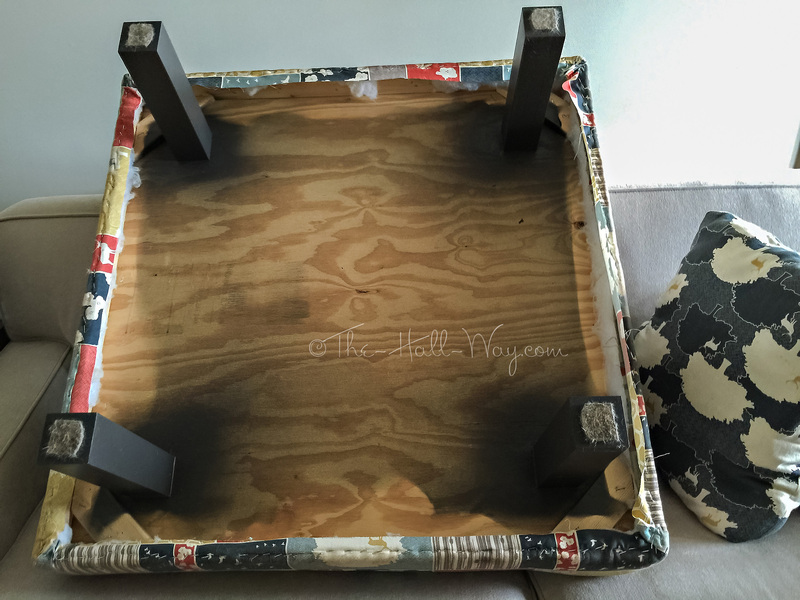 This post received a comment from Eric asking about the ottoman in our living room. This isn’t the first time I’ve been asked about it, so I decided it needed it’s own post. Here is the current version below. Information about the fabric is in this post. Our kitchen chairs are covered in the same fabric and the pillows are in coordinating fabrics. 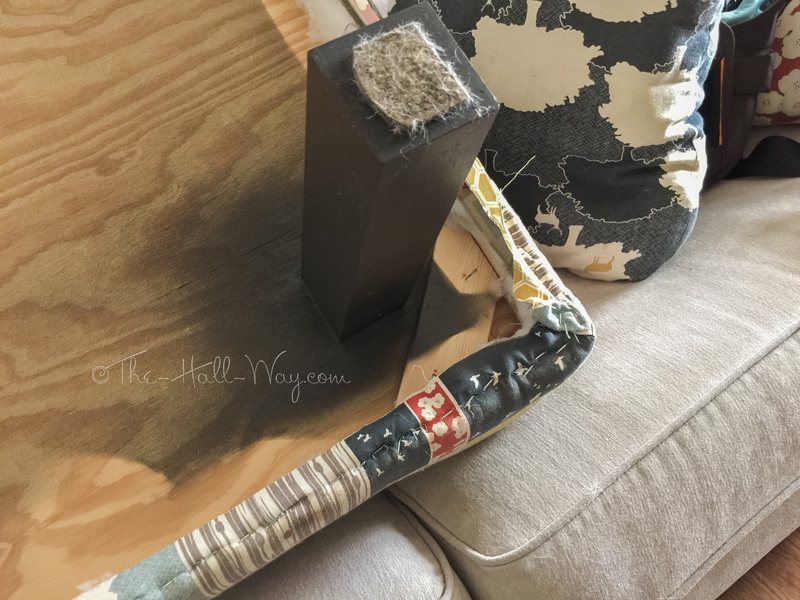 It is a home decor fabric, but I would not recommend it for ottoman, chair applications, etc. (I did give it at least 2 coats of Scotch Guard). It has faded quite a bit due to wear and I actually need to recover the ottoman because it has a tear in it now. It’s fine for the pillows, just not for a heavy duty surface like chairs or ottomans. Here is the original version with Crypton fabric and black legs. It still looked new when I took it off, but I needed something different to go with our new couches. The second version was an outdoor fabric I picked up at Hancock Fabrics. 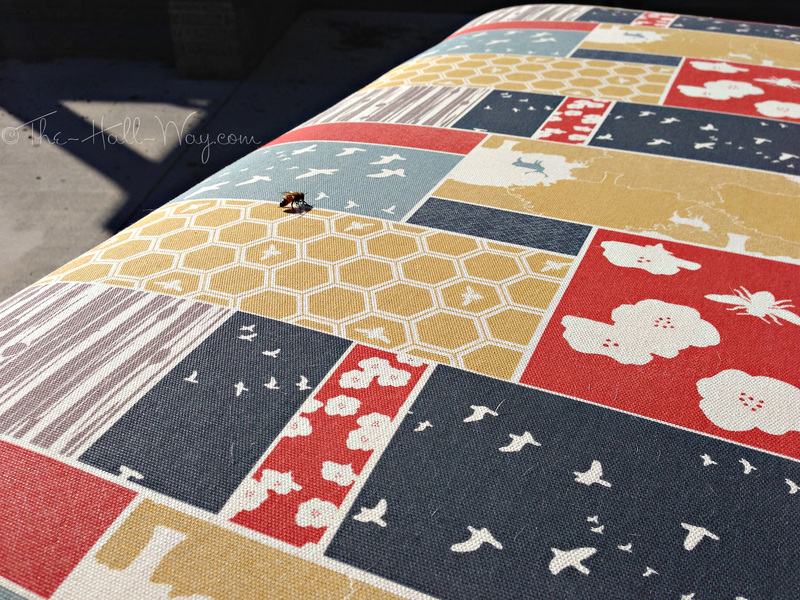 Here’s a close up of the current fabric with one of our neighbor’s honey bees checking it out (ironically). I had it outside to apply the Scotch Guard. I also spray painted the legs when I recovered it last time. They are now Rustoleum Anodized Bronze instead of black. I don’t have any in progress pics from when we built it, so these were taken today. It’s not too different from any other ottoman tutorial you might find. We cut a sheet of plywood to the size we wanted – I believe 42″ square. You could make it any size or shape. We added some furring strips to the bottom to make the sides taller. The angled pieces you can see below help brace the furring strips along the sides. 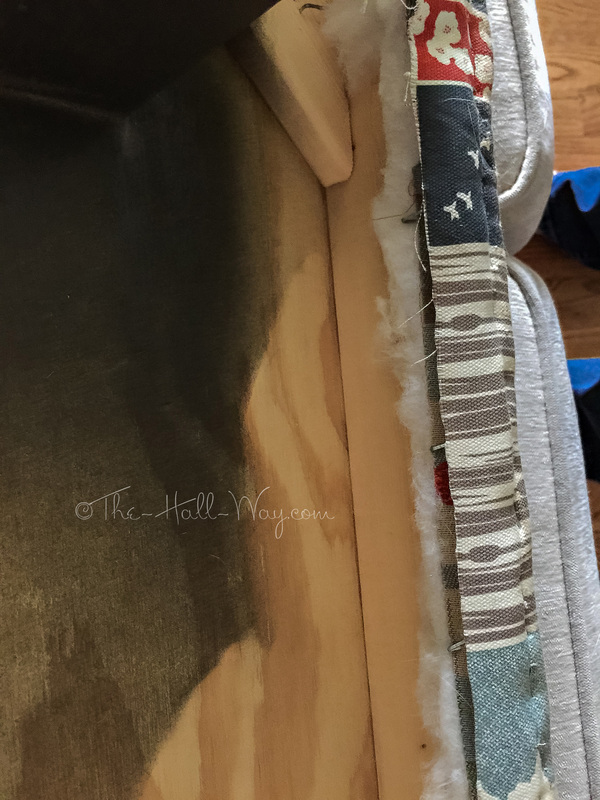 I believe we screwed the furring strips on thru the top of the plywood along with using some glue (close up picture below). The legs are just 2×2 boards we cut to the desired height and screwed on thru the top of the plywood. You could also use furniture legs purchased from the lumber store, but we went with the simpler (and cheaper) version. On top of the plywood is 4″ of foam I picked up at Hobby Lobby. I glued it to the plywood to keep it from shifting. I topped that with a couple layers of batting, then the fabric. 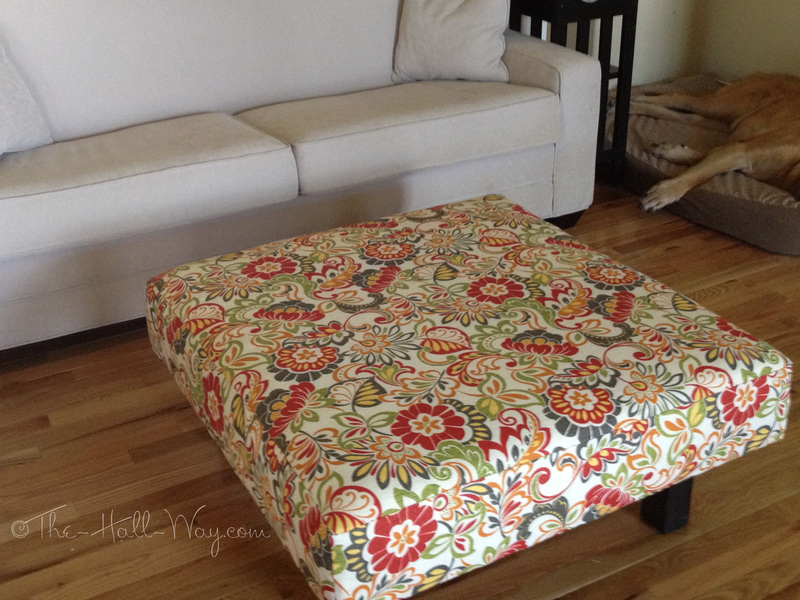 I cut the top of the fabric to the size of the ottoman along with 4 side pieces, then sewed it all together. The key is getting it the right size to fit snuggly, but not too tight or loose. 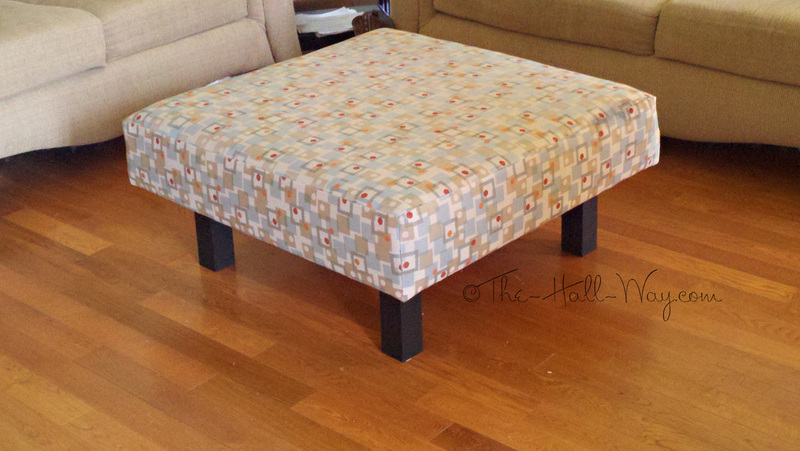 The batting and fabric is just stapled to the underside of the ottoman, as you can see. 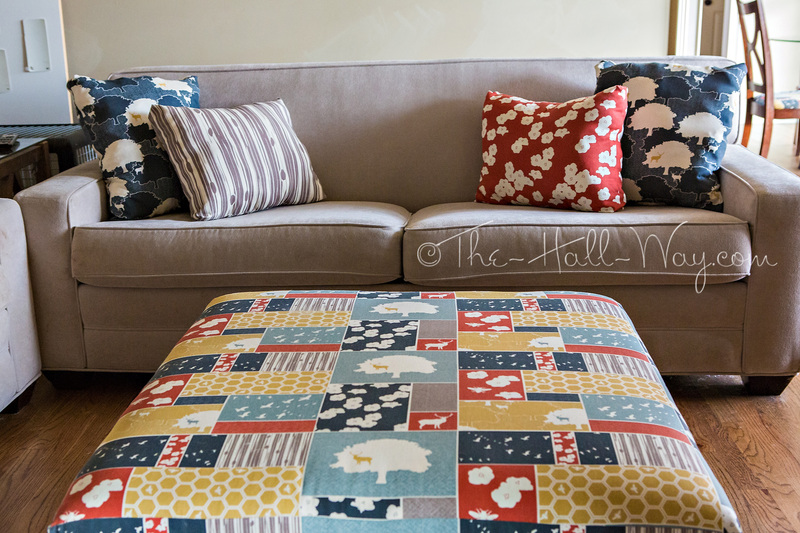 Like I said, the ottoman needs to be recovered and I’ve been in search for new fabric. I’ll try to update this post with pictures of it uncovered once I find something. Meanwhile from my last posts, the craft room has been repainted, our new office furniture arrived and the new hardwood is down in the master bedroom. I’ve been taking pictures of all the progress which I will post soon. The craft room is awaiting the old office furniture which still needs to be carted out to the garage for it’s makeover. Snow and cold temps have prevented me from being able to paint it, even in the garage. I hope to at least get started on it this week during the couple warm days we are supposed to have. David installed the quarter round over the hardwood in the bedroom after I put 2 coats of paint on it. It still needs to be caulked and the nail holes filled, then another light coat of paint over that. It’s been a dramatic transformation though. The room seems so more open and, of course, cleaner without the carpet.